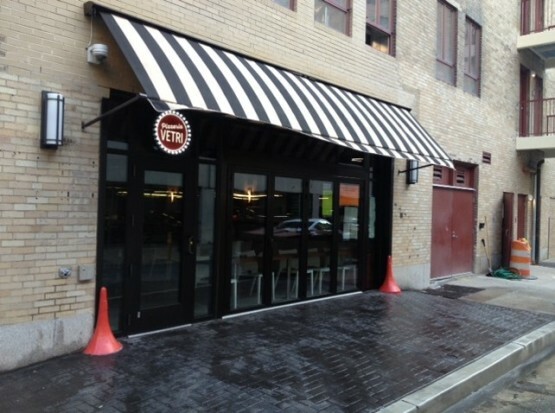 Blue Rock Construction repurposed an old parking garage in Philadelphia’s Rittenhouse Square into the city’s second Pizzeria Vetri, which is operated by acclaimed James Beard award-winning chef Marc Vetri and his partners. Built into a former garage entrance off Chancellor Street, Blue Rock overcame the challenges of limited space created by sloped ceiling and floor. The tremendous amount of mechanical, electrical and plumbing work had to fit within the constraints of this limited area. 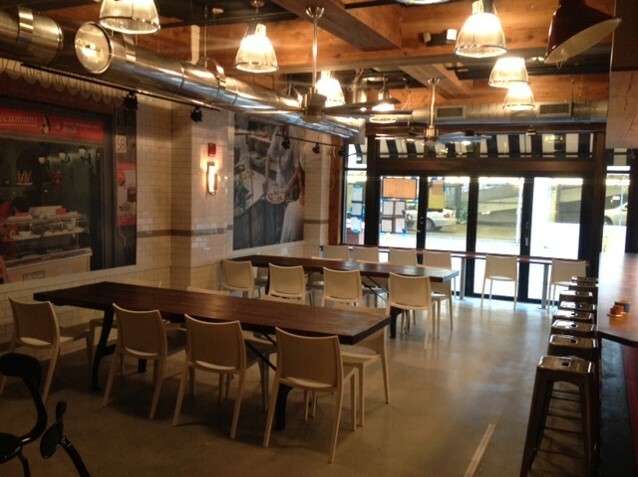 Blue Rock held weekly meeting with subcontractors, vendors and the owners to meet the fast-track, ten-week schedule to complete this tight 1,700-square-foot space. 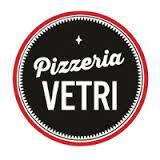 Blue Rock appreciated the weekly input from Vetri and business partner Jeff Michaud, another James Beard award winner. Inside Pizzeria Vetri are floor-to-ceiling glass doors with a beautiful white-tiled dining room and red-accented bar with an open kitchen. 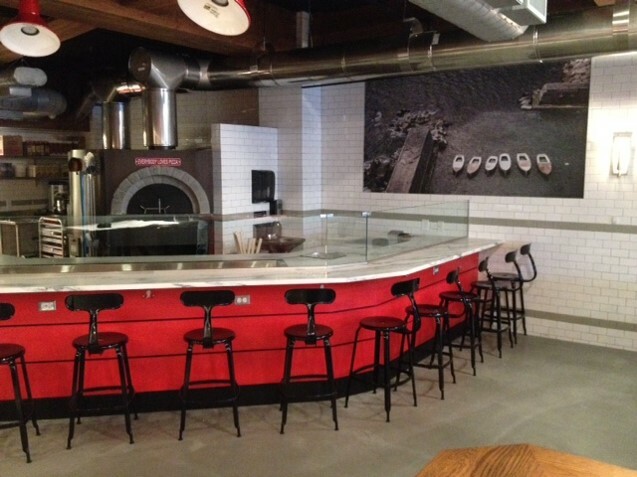 Custom mosaic tile from Italy was incorporated within the concrete slab and sets the pizzeria apart. One of the first obstacles was to install a state-of-the-art Renato pizza oven, weighing approximately 12,500 pounds. Placement of the oven, which burns both wood and gas, was very specific. It had to be locked into steel beams in order to support its weight. 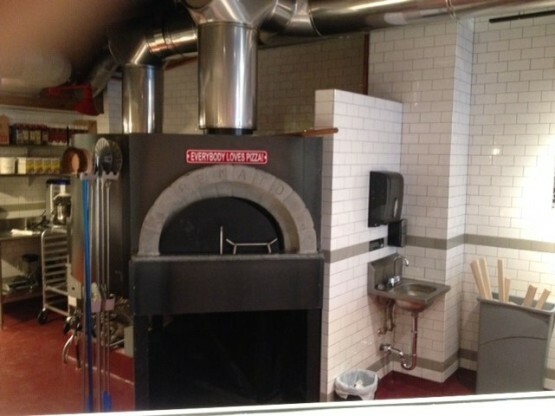 Once it was locked in, it did not move and the remaining work continued around the oven the entire length of the project. Attached to the oven is double wall, stainless steel, welded ductwork that exhausts the ovens heat and runs along the slope of the ceiling. The new exterior storefront includes an outdoor and open window seating with a sidewalk of integral charcoal stamped concrete. “We just completed what I’m hoping is the first of many projects with Blue Rock Construction. My only regret is that they weren’t involved in our first seven restaurants! “The team that Cameron Barr put together with his superintendent Greg Covaleski and project administrator Theresa Glaser were far and away some of the most professional people with whom I’ve had the pleasure of working. Each and every deadline was met (or beat), and on the occasion we were met with a challenge or an obstacle, immediate resolution was reached in concert with the Vetri Family team. “At no point during the construction did I ever feel like I had to be there. Simply knowing that Greg was onsite was an assurance that the job was getting done correctly. On occasion I would even show up at night to see the progress made during the day to find Greg doing his own personal walk through insuring nothing was overlooked. 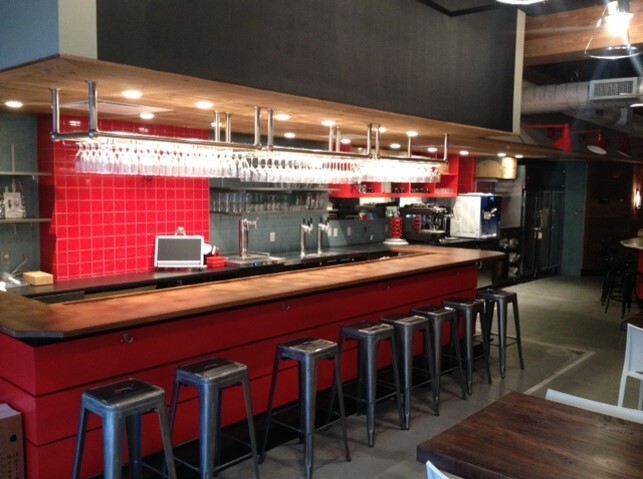 In 2013, Pizzeria Vetri debuted on Callowhill Street in Philadelphia as The Vetri Family’s only restaurant solely dedicated to the fine art of authentic Italian pizza-making. Since, it has risen to become one of Philadelphia’s must-visit dining destinations earning critical acclaim from such publications as the Philadelphia Inquirer to GQ magazine, who named it one of the country’s top 25 best new restaurants of 2014.